You can easily move a contact from the Address Book to the Children module; perhaps because you've made a mistake when importing data or creating an Address Book contact. In "Address Book" > "Contacts", locate the contact that you want to move and open their profile page. 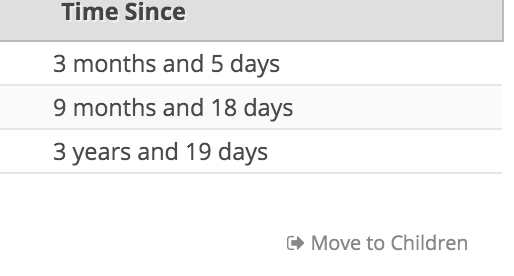 Scroll to the bottom of the page (under Key Dates) and click the "Move to children" button on the right-hand side. 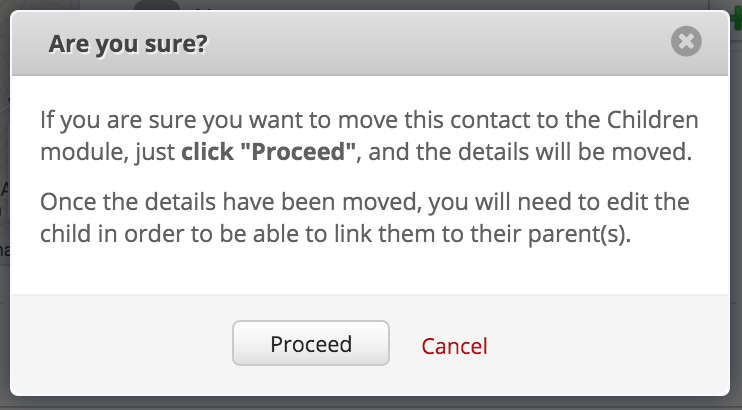 Clicking the "Move to Children" button will open a pop-over window that asks you to confirm that you're happy to proceed with moving the contact to the Children module. If you're happy to go ahead with the move, click "Proceed". Having moved your contact into the Children module, you can now continue by editing their child profile, perhaps assigning parents and to their children group. A change log is also added.